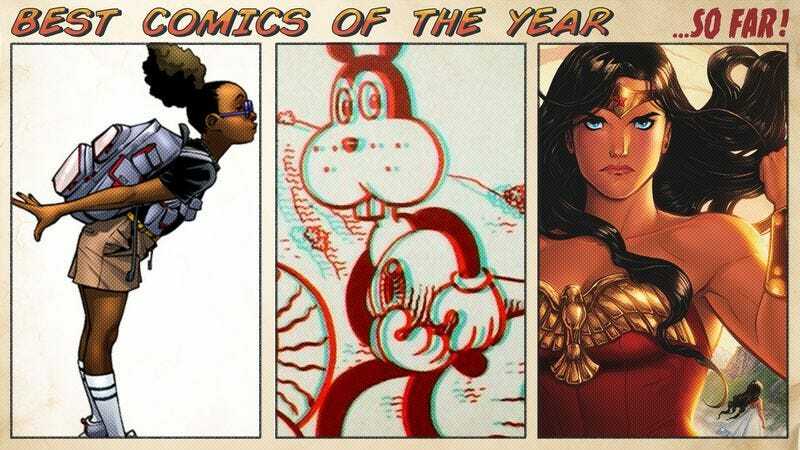 The comics landscape is expanding every year, and it can be difficult to find what’s good in the sea of ongoings, miniseries, graphic novels, digital comics, and webcomics. 2016 has featured new works by some of the industry’s top talent as well as impressive projects by up-and-coming creators, so The A.V. Club created a handy catch-up guide to direct readers to the most engaging and inventive comics published over the first half of the year. There’s a Deadpool one-shot and an all-ages retelling of Wonder Woman’s origin for superhero movie fans, alongside more highbrow titles like a graphic exploration of prostitution and religious obedience in the Bible and fictional biography that also chronicles the history of Singapore. Both long-time comics fans and newcomers will find books to enjoy on this list, and the wide variety of genres and creative voices spotlights the range of storytelling possibilities provided by the comic-book medium. This is a bit of a cheat, because these are two separate sets of comics by two separate creators, but their appeal is similar enough to appear together here. Lee Gatlin’s Spider-Man (and other superhero) online comics and Hannah Blumenreich’s Spider-Man zine provide the best superhero material you’ll see this year—and the best Spider-Man you’ll have seen in quite some time. Gatlin cross-posts his comics on both Flagpole Magazine’s website and on his own Tumblr. His fan comics are impressively engaging, with hilarious characterization of Peter Parker and other characters. They remind you of the power of strip comics, and show what’s missing from a lot of our heroic narratives.